Please refer to our stock # 1919 when inquiring. 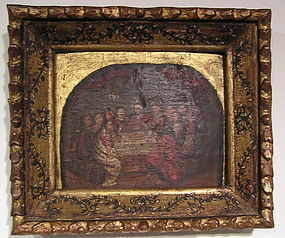 Elaborate Cuzquena School, Religious polychrome, oil and gilt on Wood Panel by Unknown Artist. Portrait of The Last Supper (La Ultima Cena de Jesus con sus Apostoles.) Circa 1820 C.E., 13" high x 15 1/4 wide x 2 1/2" deep . A compelling example of the iconography of the period. In very good condiditon. Ex: C. Lopez Torres collection, Miami. Authenticated by Stoetzer, Inc. Miami, Florida, early 19th Century with approximately 20 percent professionally restored. The Cuzco School (Escuela Cuzqueña) was a Roman Catholic artistic tradition based in Cusco, Peru (the former capital of the Inca Empire) during the Colonial period, in the 16th, 17th and 18th centuries. It was not limited to Cuzco only, but spread to other cities in the Andes, as well as to present day Bolivia and Ecuador. The Spanish, who aimed to convert the Incas to Catholicism, sent a group of religious artists to Cusco. These artists formed a school for Quechua people and mestizos, teaching them drawing and oil painting. The designation "Cusqueña," however, is not limited to the city of Cusco or to indigenous artists, as Spanish creoles participated in the tradition as well.